1. Much like Ghostbusters last year, Wonder Woman has triggered a disturbing number of reactions against it because it features a female lead. How insecure can someone be that the idea of a woman superhero feels threatening? Or that the notion of an all-women screening is somehow an assault on men’s rights? This is toxic masculinity at its purest. 2. I have nothing against DC Comics (or Marvel for that matter). My approach to review comic book-based movies is to focus exclusively on the film itself. I don’t have a “team” I belong to, at least until Haneke or Von Trier make a superhero movie. Wonder Woman, the fourth film in the DC Comics cinematic universe (DCCU) is, without a doubt, the best so far. It solves the most glaring flaws of Man of Steel, Batman v Superman and Suicide Squad while anchored in the same universe. It’s not difficult to explain the enthusiasm for Wonder Woman. DC fans are hungry for a film to be proud of, and females have gotten short shrift in the genre for decades. But the idea this adaptation solves all the franchise’s shortcomings is wishful thinking. The plotting remains shaky, and those pervasive conclusion problems persist. Thankfully, director Patty Jenkins (Monster) is savvy enough to identify and solve the biggest issue plaguing the DCCU: character development. We reencounter the titular heroine at the Louvre as she reminisces over a picture of her surrounded by a ragtag group of soldiers. Cut to her childhood as Princess Diana, daughter of Queen Hippolyta of Themyscira (Connie Nielsen). Against her mother’s wishes, Diana is trained as a warrior by her aunt General Antiope (Robin Wright). Hippolyta and Antiope’s conflicting views over Diana’s future come to a halt with the fortuitous arrival of Steve Trevor (Chris Pine), a pilot pursued by the Kaiser’s forces during the waning days of World War I. The idea of humanity at war, and the likelihood the Amazonians’ sworn enemy Ares is behind it all, inspires Diana to follow Steve to London. Discovering humanity doesn’t require the God of War’s involvement to behave badly stumps Diana, but doesn’t deter her heroic disposition. Her naiveté contrasts with the jaded men in charge, who treat the conflict as if there weren’t lives at stake. Casting Gal Gadot as Wonder Woman may have been Zach Snyder’s smartest decision in reinvigorating the DCCU (followed by getting Hans Zimmer to create her signature theme). 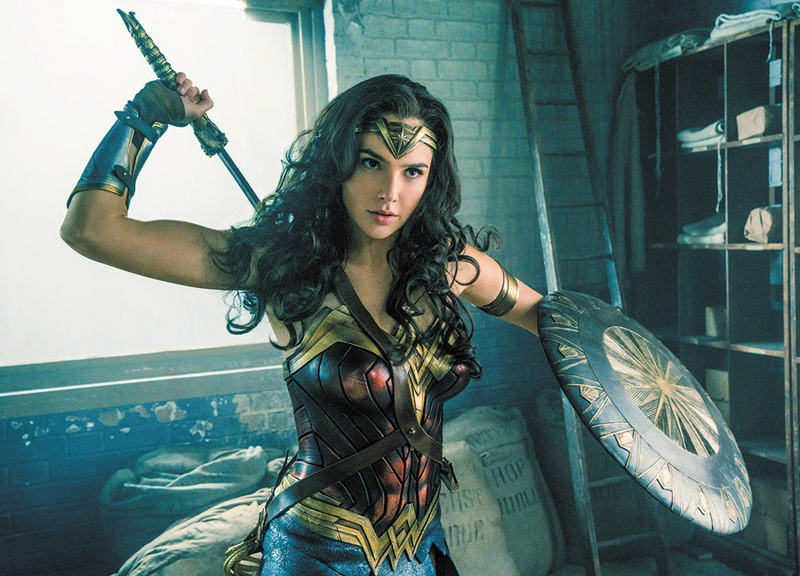 The athletic, stunning Gadot doesn’t have the widest acting range, but commits to her character in ways Ben Affleck and especially Henry Cavill can’t begin to imagine. Wonder Woman also benefits from being a truly self-contained story. No shoehorned tie-ins or distracting cameos. The plot may be basic, but I’ll take it over whatever the heck Batman v Superman was. The editing makes sense, too, and the action scenes are competently staged. Some are even gorgeous to watch. Director Patty Jenkins excels at composing characters and her skill goes beyond Wonder Woman. Chris Pine doesn’t play the dude in distress or Diana’s equal. His Steve Trevor is a hero in his own right who happens to cross paths with the Princess of Themyscira. The rest of the cast is somewhat underserved, but this is Diana and Steve’s story after all. Wonder Woman is frontloaded. The world-building at Themyscira is impeccable, and Robin Wright excels in an all-too-brief role. Jenkins creates an image-positive environment in which women are physical and lithe (a female Sparta is a striking sight). The goodwill generated is put to the test in the third act where the movie falls prey to the genre’s worst instincts and becomes a fireworks spectacle. The main villain, Ares, is poorly defined, and the payoff is underwhelming.